Lynyrd Skynyrd Guitar Signature Licks PDF + Mp3 CD download. Explore the Southern Rock mastery of Lynyrd Skynyrd’s multiple Guitar assault, featuring: Gary Rossington, Allen Collins, Ed King, and Steve Gaines. Performance notes and directions written by Dave Rubin. A step-by-step breakdown of the band’s Guitar styles and techniques. Listen to music, follow the tabs and play like your favorite musician. The Signature Licks Series features book and CD packs and DVDs specially designed to teach a musician the trademark techniques of popular artists and musical styles. Each package features an in-depth breakdown of the riffs and sounds unique to the band or artist: the sounds which have led the band or artist to be recognizable by their own signature sound. The Signature Licks Series is an excellent resource to learn what makes for a unique sound as well as help you develop your own. These are accurate tabs. Not every part of the songs contained but the signature licks and solos for the most part. If you have problems following the tabs the cd will help you along. Be prepared to work hard. 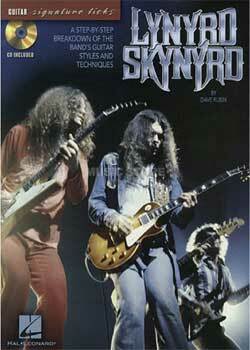 Download Lynyrd Skynyrd Guitar Signature Licks PDF free and other books from our site. Only high quality PDF scans. Please write a review, it's important for our community. The great stuff for every rock’n’roll survivor!